Would you like to schedule a Hug-A-Horse Event for your private group? Give me a call at 206-948-4026 and we will schedule it. Come out to the Centaur Development Wellness Ranch to spiritually connect, heart to heart, with gentle horses. 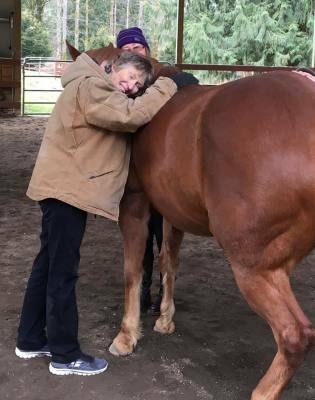 Ella and Zea, my equine partners, are natural healers and love to share their gift of being able to connect, on a soul level, with people. 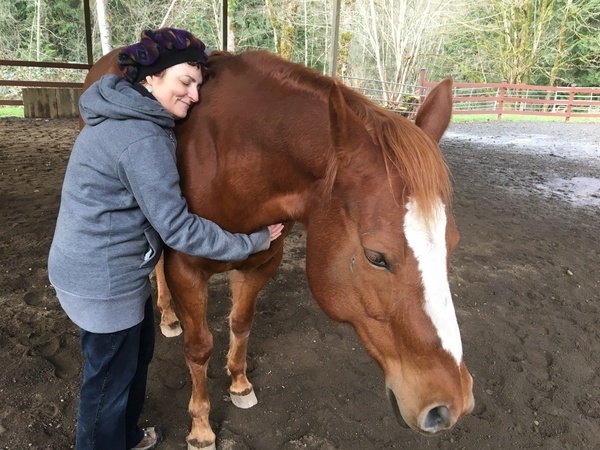 I have been facilitating equine guided workshops with my equine partners, Ella and Zea, for over ten years at my spacious Snohomish horse ranch. I enjoy helping people create that special horse/human bond. This time with the horses will prove to be magical and memorable. If you love horses, want to be around horses, or are simply drawn to the Spirit of the Horse, you will cherish this learning opportunity. Come join me to interact with special horses for a fun, safe and powerful equine and human bonding experience.